Erik Jones put his No. 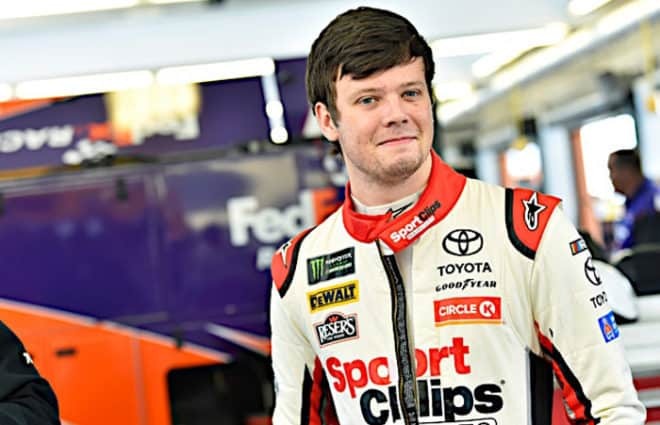 20 Toyota at the top of the charts in the last of two Monster Energy NASCAR Cup Series practice sessions at Charlotte Motor Speedway on Saturday morning (May 26). Denny Hamlin led the opening practice session on Thursday and the second session, scheduled for Saturday morning, was rained out. Jones’ fastest lap had an average speed of 187.045 mph. Kyle Larson (186.104 mph) was the fastest Chevrolet in second, and Team Penske teammates Ryan Blaney (186.104 mph) and Joey Logano (186.047 mph) were third and fourth, while Hamlin (185.938 mph) rounded out the top five. Pole winner Kyle Busch (184.691 mph) posted the 18th quickest lap and defending Coca-Cola 600 winner Austin Dillon (184.420 mph) was 20th. The green flag is scheduled to waive for the 59th annual Coca-Cola 600 on Sunday evening (May 27) at 6:18 p.m. ET. The event will air on FOX and PRN.